He is persistent, and he knows what he wants. Several months ago we were invited to be part of a blog tour for Amanda Maxlyn's debut novel What's Left of Me. After reading a brief synopsis we just knew this was something we had to be a part of and absolutely could not wait to get our hands on the ARC. We were so intrigued by the fact that Amanda was taking on the subject of cancer because it's just not a common theme or element for a main character in most books. I mean seriously the synopsis alone left us curious and wanting more. What would the story be like? Would cancer be the focus or would the focus instead be a love story? Would our main character live or die? Can a book about a character fighting cancer have a HEA? Needless to say as soon as the ARC arrived we both dove right into the story. So, let's talk about the 2 main characters, Aundrea and Parker. I was in love with Aundrea at the end of the first paragraph. She is an amazing character who never gives up on life and believe me her's is a hard one. Talk about inspirational! She is strong emotionally, mentally and has fought cancer for years, so much so she feels like it's taken over her identity…she's just the girl who's sick. People look at her differently, treat her differently. It's as though people only see the sickness and not the real person. Can you imagine? How would I handle being treated differently, looked at differently? Honestly before this book I hadn't even considered this "side effect" of cancer. What would you do if given the chance to escape the reality of cancer for a chance to be "normal"? Aundrea gets this type of opportunity when she first meets Parker. The chance to just be herself, for someone to see her as a young, beautiful, healthy woman, and not a cancer patient. Parker, Parker, Parker!! Wow, I can say without a doubt he has easily become one of my all time favorite book boyfriends! Like Aundrea, I felt drawn to him after just one run-in. While Dre and Parker may consider their meeting accidental I'm going to describe it as divine intervention! Their bathroom encounter was awkward, it was hilarious and there were sparks were flying all over the place. Initially Parker was so mysterious I couldn't help but wonder if he was just another hot, "bad boy" out looking for some fun. But, as the night goes on you realize there just may be more to him than eye candy and a good time. He really is one of the most unselfish, amazingly generous fictional characters around. Words cannot express how much I love him. Watching Aundrea and Parker's friendship blossom was beautiful, these two really brought out the best in on another and while they tried to fight the physical draw eventually their chemistry just couldn't be stopped regardless of any reasoning not to move forward! But, darn you Amanda Maxlyn even though I knew the struggles Aundrea was facing, the reasons why she wanted to hold back you still made me fall so hard for these two as a couple I had no options other than to turn into a nervous wreck! The tears couldn't be stopped as I desperately watched Aundrea struggle through her chemo treatments, the side effects, her doctors' diagnosis' all the while wanting nothing more than to comfort her, bring her peace, be strong for her. I fully experienced each of her high's and every single low. I was a train-wreck, but it was hands down one of the best rides I've ever taken! Aundrea is super stubborn and I can relate to that part of her personality exceptionally well. I thought was having a pretty stressful, all around crap week at work when I started this book, but it really forced me to put my live in perspective. The writing, the plot and the character development were all superb. What's Left of Me is not to be considered a fluff read. This book is so much more than you will ever expect. It's a love story, it's about fighting for your life, it's about facing your demons and finding a way to live through your darkest fears, it's about finding strength in a person you love and allowing those who love you support you. I absolutely refuse to give anything else away, but let me say buckle in and hold on for the ride of your life. Just when you think it's safe to breathe you are thrown into another "what the hell...did that just really happen" moment. 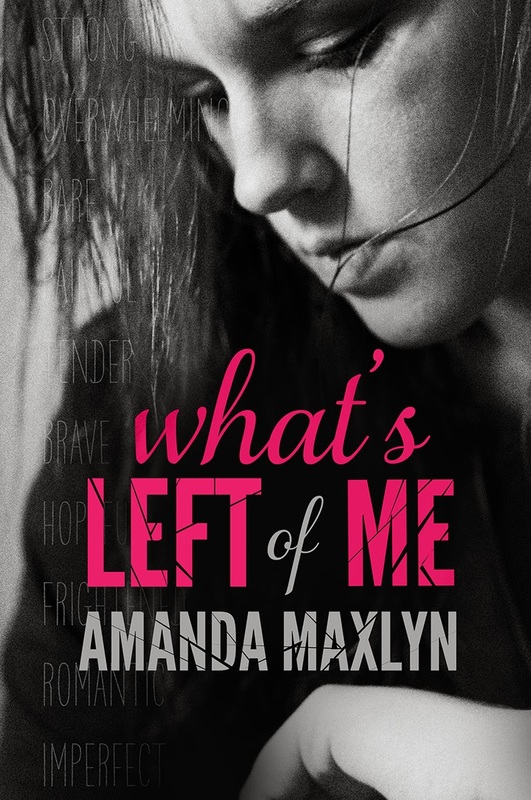 Seriously, Amanda Maxlyn you are positively brilliant and I loved every single line of What's Left of Me. So, will Dre be victorious over cancer? What will happen when Parker finds out her secret? Have you one-clicked this book yet? What are you waiting for? This is a definite must read for anyone who simply loves a good story. I can guarantee Aundrea's story will have an impact on you, her's is the kind that stays with you long after the last page is turned.